This dish is a takeoff on a recipe by Lydia of Lydia’s Loving Foods. I have eaten at her café a few times and I always get a side of raw rice even if the dish comes with. It’s that good. I wanted to be able to make something at home that came close to her delicious recipe and I think I’ve accomplished that. Process all the ingredients except the hemp seed in your food processor with the “S” blade. You may have to do it in several batches. You want to get the veggies down to small particles, about the size of half a grain of rice. After processing mix in hemp seeds and serve. This could be a nice main course for one or a side dish for several. Enjoy! I see that some folks don't understand raw rice. I have taken to spelling it RYCE in order to indicate it is not the same as RICE. This may help with recipe titles. Thanks for your lovely recipes. A There is no real rice SW, the cauliflower mixture is meant to replace the rice. 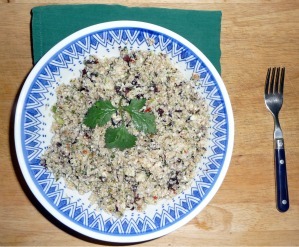 I too love Lydia's raw rice, and Hugh's recipe is really delicious! If only I had a food processor, I'd make it all the time. It's so satisfying and tasty.